ZEPBOX specializes in building camper units for expedition trucks. They are simply great people who became good friends. They helped us with the wall lining and insulation, as well as with the cabinets. Eberca bvba Haasrode, Belgium, specializes in mobile heating, airco and electrical systems in buses, trucks, boats and expedition vehicles. 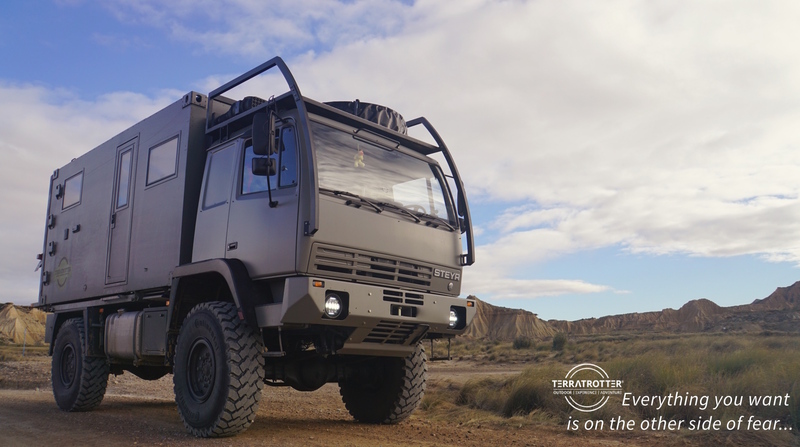 They are not only experts in their field, they also know the world of overland travel and understand the complexity of building your own expedition vehicle. Thus, the perfect partner for our building project. HENKE specializes in sheet metal work, transformer accessories, welding and powder coating. Sharing our love for off-road vehicles they helped us with various building projects for our expedition truck (as well as with older projects for the Land Rover and Jeep). Excap specializes in the STEYR 12M18. Their knowledge and service convinced us of purchasing our truck from them. This has been a very positive experience; always helpful and friendly. Handyfloor is specialized in PVC floors and has showrooms in the Netherlands and Germany. The enthusiasm of their branch manager in Utrecht, Theo Tsouvelekidis, left behind a very positive impression. Therefore, we gladly purchased the floor for our expedition truck from them. Zurrschienen provides everything for flexible transportation systems. We used their lashing rails and sleds to build our bed. Personal friends, who helped us with several building projects. A dutch speaking forum about overland travel and building an overland truck.